The majority of western red cedar cladding seen in this country is imported from North America and Canada. However, British cedar has been grown in our woodlands for over one hundred years and the mature trees are ideal for timber cladding production. 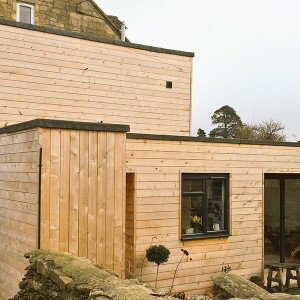 As Canadian cedar becomes increasingly expensive, our British cedar cladding offers a significantly cheaper alternative and avoids the substantial environmental impact of shipping timber to the UK. For a comparison between British and Canadian grown western red cedar watch our new video. 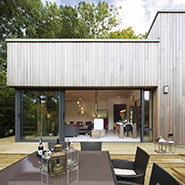 Freshly cut or machined, British cedar cladding has frequent small- to medium-sized dark knots and an amber colouring which, if left untreated, will bleach to a silver colour. It is faster grown than imported cedar and is therefore softer. Unlike most other coniferous softwoods, British cedar does not contain any resin so can take a range of paints, oils and stains. Appearance British western red cedar has a pink to amber colouring with frequent dark knots. The colouring of British WRC is paler, but more consistent, than its Canadian cousin. Weathering When left untreated, cedar will bleach to a silver colour. Because of its relative consistency British WRC weathers more evenly than the Canadian. Northerly elevations may weather to a darker grey than those facing South. Insect attack Resistant. Wasps seem to like peeling the surface. Working properties Good workability. Takes fixings satisfactorily. WRC is soft and relatively brittle which can result in bruising and splintering. No pre-drilling necessary. Extractives Western red cedar contains reactive oils, which will corrode ferrous metals. When the two come into contact, a blue sludge is formed that will stain the wood and anything else it meets. All fixings used in conjunction with western red cedar should be stainless steel. The oil is brown in colour, could leave unsightly brown stains on the surface of the cladding, and will stain any porous materials below the cladding. 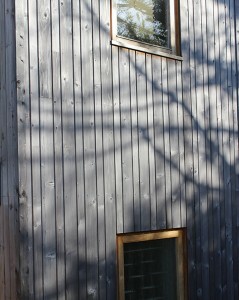 The reactivity of the oil makes western red cedar cladding unsuitable for polluted areas and shaded areas.